at Weifang community in Pudong New Area. Foreign students from the International Education College of Shanghai University of Traditional Chinese Medicine visited elderly people at a nursing home in Pudong New Area on April 12. The student volunteers visited the Old People Care Home at Weifang community in Pudong’s Lujiazui financial district. They chatted with the old people on regimen of traditional Chinese medicine, sang songs for them and did some handwork with them. 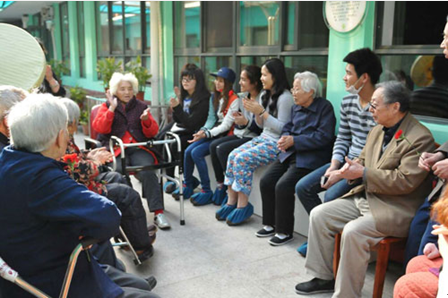 The Old People Care Home at Weifang community is established by izhaohu, a non-profit organization on caring for the elderly. The foreign students brought much warmth and laughter to old people at the nursing room. As the first city to become an "aged society" in China, Shanghai is trying to build more care facilities to meet the demands of an aging population. The city has about 3.88 million seniors aged above 60 as of the end of 2013, making up 27.1 percent of the total registered population, according to statistics from the Shanghai Civil Affairs Bureau.